But, perhaps the most frequent one relates to the trip itself. Lets start out with some basic Florida geography. 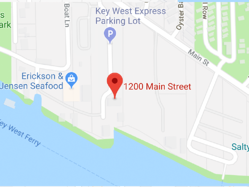 By land the Florida Keys and Key West are accessible by only one road, US1 or Route 1. This runs from Maine all the way to Key West. From the mainland south of Homestead, on the east coast to Key West you would be driving approximately 113 miles and travel over 42 bridges, connecting 43 islands or Keys, with one of the bridges being 7 miles long (aptly named the Seven Mile Bridge)! Making that drive can be a challenge itself. From Fort Myers, the 145 mile drive can easily be 6 plus hours. 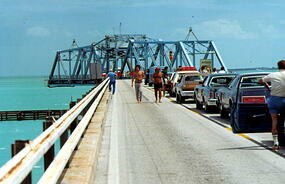 US1 in the Keys is primarily a 2 lane road; only 1 lane going and 1 lane leaving. So, if there are any delays, accidents, mishaps or draw bridge openings, US1 will turn into a massive parking lot until the delay is sorted out. 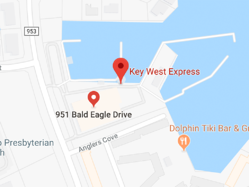 Now, by water we soar by those delays and mishaps as we travel on the crystal blue waters of the Gulf of Mexico in a trip only slightly over 100 nautical miles from Fort Myers Beach to the terminal in Key West. Our jet powered catamarans travel at approximately 40 knots and make the trip from "buoy to buoy" in just about 3.5 hours. What buoy to buoy means is from the time that we get out of the harbor on one side and reach the main channel on the other side. Travel time in the harbors can vary, as we have to keep a keen eye out for other boaters, jet-ski's, kayak'ers, etc. From Marco Island/Naples, a bit south of Fort Myers Beach, that trip is approximately 3 hours. 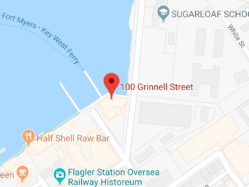 So, if you'd like to take a vacation away from the usual and enjoy a tropical cocktail and bite to eat during travel, click below, make your reservations and leave the driving to us!